Well, this is pretty awful. 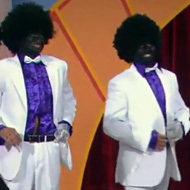 On yesterday’s reunion special for long-running Australian variety show Hey Hey It’s Saturday, a group of singers calling themselves the “Jackson Jive” performed a galling version of the Jackson 5’s “Can You Feel It” in blackface makeup, to predictable boos from the studio audience. Guest American judge Harry Connick Jr. took issue, thankfully, giving the Jive a “0” and telling the tone-deaf host, “If they turned up like that in the United States, it’d be like Hey Hey There’s No More Show.” Click to watch (and cringe).